★ 16 Colors change: red, green, blue, yellow, cyan, purple and white etc. ★ Touch Mode: Please press the touch button once to change one color, if press 8th times, the colors will be changed automatically. Hold switch down for 2 seconds to turn off. ★ Remoter Control Mode: the New Function of Remote Control with On/Off, Reset, Move next / move pre- Stay in a single Color button,16 Colors Change with Many Modes Such As Dimmer, 4 Flash Speeds, Regular/Irregular and Fast/Slow 7 Colors Changing Automatically. ★ 3D vision effect, especially in the dark or take a photograph, the vision thrill will be strong! ★ Low consumption, will not be hot after long time working, Light source use the high-quality LED, light is soft and uniform, no dazzling, non-flicker, won\'t hurt eyes. 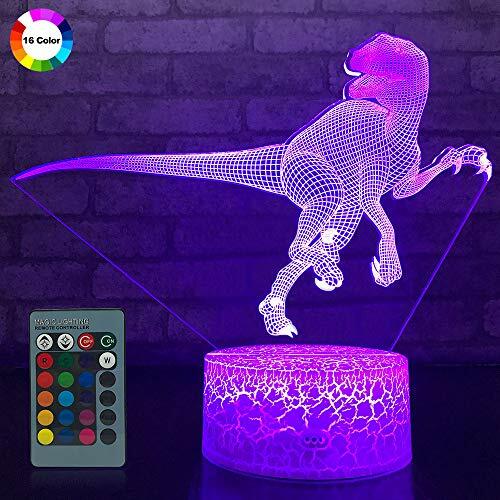 ★ Dinosaur night light：Widely used in various environment decorations, improve environmental artistic taste,showing warm fresh, fashion 3D visual impact.